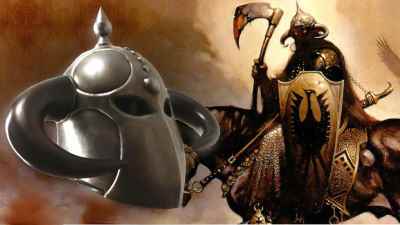 The Death Dealer Helmet is an ominous helmet said to give the wearer inhuman power over death. 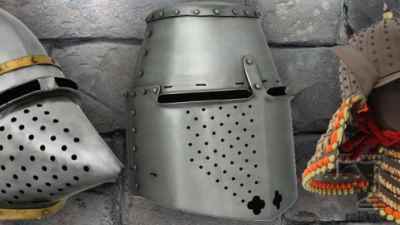 This famous helmet has given inspiration to many notable artists and fans of video game, fantasy movies and role playing games like larp and rpg's like dungeons and dragons. The 1973 �Death Dealer� painting by Frank Frazetta has inspired this generation and Museum Replica's Limited. MRL began work with the Frazetta Art Museum on an exclusive Frank Frazetta Collector Edition line to bring the Death Dealers armour and weapons collection to life. This stunning piece has been forged from 18 gauge steel by the master smiths at Windlass Steelcrafts and is an incredible addition to the Frank Frazetta Collector Edition line. This helmet is fully lined in suede and has an leather adjustable liner. Features custom fiberglass horns / tusks. This entire piece has been hand finished with an antique look. Includes custom display stand in the shape of the Death Dealer�s shield and a Certificate of Authenticity.